I became part of its pure movement." I first read Pablo Neruda’s poem The Sea as a graduate student while working on Appledore Island – a little island one mile long and one-half mile wide, ten miles off the coast of southern Maine. It was one of those perfect stormy, gray days that was amazing to watch, but much less fun to be out in a small boat doing research. Looking out at the swell rolling in across the Atlantic, Naruda’s words were etched in my mind. Neruda captures so well a feeling of motion that anyone of us who spends time around the ocean experiences. The tides ebb and flow, waves slap ashore, and currents stream by. But its more than that – the sea’s animals are in motion too. Salmon that began their life hundreds of miles inland swim past us on their thousands-of-miles journey through the Pacific. Humpback whales, which we are seeing in the Pacific in ever-increasing numbers, can travel more than 13,000 miles in a year. And Steller sea lions make phenomenal dives to depths of up to 1,500 feet to feed, staying underwater for as long as 16 minutes. A few years ago a 14 foot pregnant six-gill shark washed up dead in South Puget Sound. My team from NOAA took samples from the animal and found that its tissues were laced with a form of the pesticide DDT that we know was used only in California more than 40 years ago. Pesticide that a farmer had sprayed decades ago on a field 1,000 miles away had just washed up on a beach only a few miles from my Seattle home. The ceaseless movement of water and animals connects us. It connects land and sea, sun-drenched shallows and dark ocean depths, distant continents and even time. But as much as the ocean is about movement, we also turn to the sea for a sense of stillness. And stillness, it turns out, characterizes the lives of many of Puget Sound’s fishes. Some of you may know one of my favorite fish: the lingcod. Besides being delicious, they are an important top predator in Puget Sound; on average, only killer whales are higher on the food chain in Puget Sound. But what else do we know about them? For properly managed fisheries, it is essential to know where fish live, what habitats they use and how far they travel. To get at this, NOAA captured fish and inserted tiny transmitters into their bodies. We could then track their movement day and night for months. We were amazed to learn that they hardly move – if they lived on a football field, their whole life would take place in the red zone of a football field between the 20 yard line and the goal line. A full-grown lingcod is half the size of a full-grown human; imagine if you spent your entire life – working, meeting friends, finding food, eating, everything – in an area the size of half a football field. This isn’t something that is unique for lingcod. 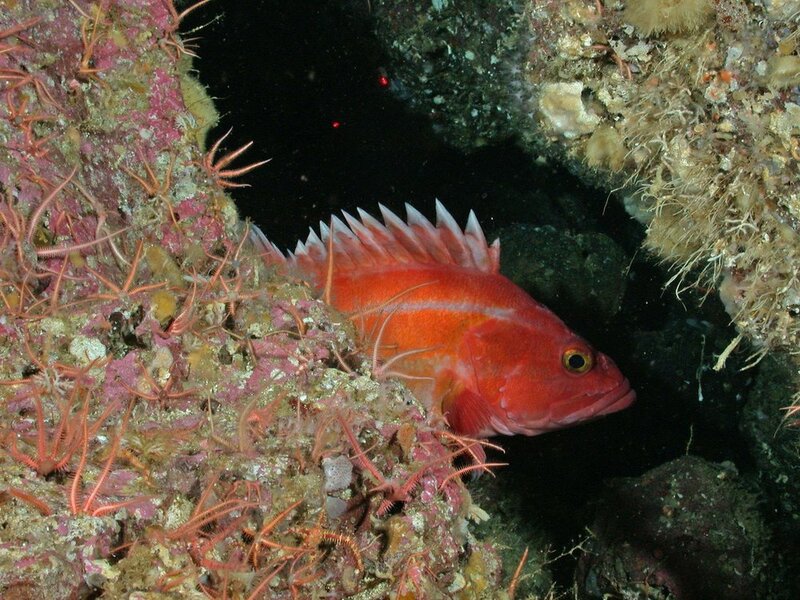 The same is true for many fish, including yelloweye rockfish and bocaccio rockfish that live right here in Puget Sound – and are on now the Endangered Species list. In fact, when we look at fish overall, we see that, despite some fabulous exceptions like salmon, fish have the smallest home ranges for their size of any vertebrate animal. A raccoon in the city has a home range of about 28 football fields, or 140 times the home range of a similarly sized lingcod. Why does this matter? In the early 1980s, rockfish were not really fished commercially in Puget Sound, and some fisheries managers thought they would be a great resource to exploit. Rockfish are a mild, tasty fish and they quickly became popular. The rockfish fishery boomed – you could even see an explosion of rockfish recipes in locally published cookbooks. But fisheries managers didn’t know that rockfish do not move much, and they did not know they grow slowly, mature late and have long lives (yelloweye rockfish can live for 200 years!). All this means that rockfish are easily overfished. About ten years after the Puget Sound fishery boomed, it was shut down. After ten more years, three Puget Sound rockfishes were on the Endangered Species list. So, many fish basically stay home their whole lives. These fish can’t escape the effects our activities have on their homes. New brain research is showing that our brains are hardwired to react positively to the ocean, and that being near it can calm and increase innovation and insight. It’s not surprising, then, nearly three billion people globally live within 60 miles of a coast, or that population growth along coasts is six times greater than inland areas. As more and more people come to the shore to seek solitude and inspiration, we must let the sea teach us. Let it remind us that we are connected – that how we act transcends space and time. And for animals that can’t just get up and relocate, the consequences of our actions can be dire or provide solutions that make our piece of the world a better place.